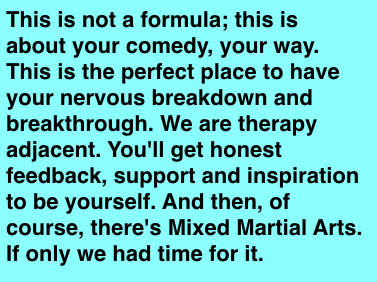 Instant Comedy Workshop Classes are for all levels, ages and backgrounds who want to learn stand up. Whether you're a beginner, have some experience, or are a more established performer, this is a safe place to play, experiment, develop, create, laugh, meet new friends and work with other funny people. Ed has been a professsional Stand Up and Emmy winning Comedy Writer for over 20 years. He has worked with the greats; From Larry David and Jon Stewart to Ellen Degeneres and Sara Silverman, to Zach Galifinaikis and Louie CK, Bob Newhart, Fred Willard, Milton Berle, Lily Tomlin, Bill Hicks... you name it. Go ahead, you name it________. He has been seen on Conan, Curb, Hot in Cleveland and The Sopranos.